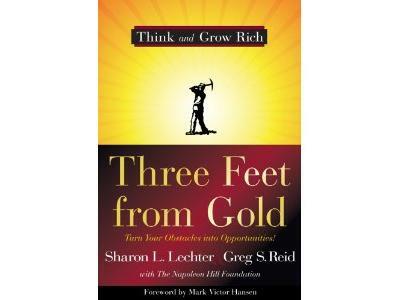 Authors Sharon Lechter & Greg Reid recently collaborated on Three Feet from Gold to inspire aspiring entrepreneurs. A century ago, Napoleon Hill began researching and writing his classic, Think and Grow Rich— which sold more than 100 million copies worldwide. On this 100th anniversary comes a fresh and modern look at the core theme of Hill’s master work. Three Feet from Gold takes the principle of never giving up from the revolutionary best seller and presents it in a new and modern fable. A young writer sets out to interview business leaders and other influential figures of today about the importance of persistence in attaining your goals—including Dave Liniger, chairman and co-founder of Re/Max; John St. Augustine, producer of “Oprah and Friends” Radio Programming; Debbi Fields, founder of Mrs. Fields Cookies; boxing champ Evander Holyfield; Symphony Orchestra conductor Jahja Ling; the Nobel nominated founders of Childhelp.org, Yvonne Fedderson and Sara O’Meara; and NASCAR President Mike Helton. Through these inspirational real-life stories, Three Feet from Gold offers advice about having passion for what you do, finding your own personal Success Formula, choosing good counsel, and above all: never giving up.